My husband has been into prepping for some time, while I’m fairly new to it. He’s been working on the below timeline for a while (he’s an engineer – he likes to understand the how and why of everything in detail). We’ve been talking it through and rolling it over in our heads. I can’t count the number of times Mr. WPW asked, “if things went south how do you think people would react” or some variation on that. What you’ll find below is mostly Mr. WPW’s work. We talked it out a lot, and I contributed, but he really did most of it and deserves the credit. The information comes from many sources. We both read everything we can get our hands on when it comes to prepping: history, politics and news, emergency management, homesteading and country skills, and medicine, amongst others! This is a list I put together from many sources. It is a study, not an original work. Comments and discussion are welcome. Let me know what I missed. Definition: An event – sudden, damaging and lethal – that occurs with little or no notice with major global effects. This would be an event that has no precedent in living memory and changes the trajectory of our culture and civilization. Disambiguation: this is not a hurricane, blizzard or typical earthquake – these are relatively short term localized events. They can be serious but would not be considered a catastrophe for the purposes of this study. This does not include slow events that can take a generation or more to have an effect like population growth, desertification or climate change. Again, serious but not covered in the scope of this study because of the lead time for society to adjust. Examples: super-volcano eruption; large earth impact; pandemic with high lethality or serious chronic injury to humans; major crop failure to cereal grass(es) from disease; Coronal Mass Ejection/Solar Mass Ejection/Gamma Ray Burst and other rare solar/cosmic events; widespread (nationwide/invasion, U.S. civil, or world) war; energy distribution failure or major energy shortage. Other events calibrated within this outline would include any event expected to cause a human population decline of 30% or more within 2 or 3 years in the United States. This occurs in my area before a blizzard or hurricane. National Guard and other troop movements will shock many people. In the absence of factual information, conjecture will pass for news on media (reporters interviewing other reporters, as an example). Scope, scale and or cause of the disaster may not yet be apparent or understood. Local panic may occur. General panic has not set in yet. Municipal services still function. Hospitals are open, fires put out. ATMs empty or stop working; it is unlikely they will be serviced or repaired. People who are comfortable in their surroundings (typically those at home) are still hospitable, especially to neighbors and others to whom they have strong social ties. This is a common reaction to sudden shock. These efforts generally produce very little. If they haven’t already, the utilities go out – this will include power, water, sewage, natural gas, even phone, internet and television. The ability to handle the dead is out stripped by volume. If all active duty military, law enforcement, National Guard and military reservists were simultaneously combined they would still be overwhelmed by a riot of only 1% – 3% of the population. Put simply, they would likely shoot first and often to ensure order is kept and people obey. Lone wolf preppers will become a problem for the short term – people whose planning consists of having weapons and ammo cached and taking what they need or want from others. What is left of society will not tolerate them for too long. By definition they will not likely merge or mesh with community. This includes the small proportion of our society (around 2% who do not mesh well within society in general). Religious organizations make natural distribution centers for goods, information, and other community needs. City water requires pumps to refill water towers. Outside of many cities the houses have wells powered by electricity. Food poisoning and diseases such as cholera from bad water, salmonella from unrefrigerated food, etc. Moral imperatives have now evolved to the immediate. People who couldn’t have deliberately killed someone before the event might actually stalk and kill another person. Local doctor, nurse, midwife, veterinarian, etc. Large mammals are not efficient at converting grass to food so rabbits and sheep may be much more common. New forms of money and/or currency may be created. May be limited in the areas where they will be accepted (regional). Retraining would have to happen on a massive scale – less than 2% of the U.S. population are farmers. Most of the current US farmers do not know how to farm without mechanization and delivery chains. Old skills and trades become commonplace again, such as sewing, food preservation, blacksmithing and carpentry. The population and division of labor will stabilize at the new balance. For the survivors, life goes on. If the data infrastructure is intact (e.g. libraries) recovery may be accelerated. We are working on a SHTF Action Plan that we’ve broken down kind of like the above. What do we do if we think it’s going to be a tier 1 event (hurricane we know is coming, bad winter storm, etc. ), tier 2 event (something that might last a couple weeks to a month), all the way up to a tier 3 event (the S has HTF and the world will never go back to what it used to be). When it’s done, we’ll print it out (and I will put a copy on my smart phone, too) so if something happens we know what to do. For instance, while people are just realizing “hey, this thing that happened could be bad”, we’re already hitting the grocery store and pharmacy. When they’re swarming the grocery store, we’ll already be hitting the hardware stores. And so on and so forth. I don’t know that it will be terribly useful to post, though, as that kind of thing is very individual based on needs, location, plan of action (for instance, ideally we already live in our bug-in location, some people will be bugging out), etc. We’re also going to include addresses of places we want to go, local warehouses, specialty shops for things like animal care, etc., so we aren’t trying to find them in an emergency and/or we can go to places that will have what we need, but that people won’t immediately think of. I think in an emergency I’d rather go get my pet food/fish antibiotics/etc. from the tiny local pet shop than fight several hundred or more people swarming the local Walmart Super Center. I think the most important part of a SHTF Action Plan, other than doing the proper planning/prepping, is to have it written down and easily accessible. I don’t know about you, but the LAST thing I want to have to do in a crisis is remember what to do in what order. Having it written down allows you to get through the panic a lot faster. Thank you for taking the time to read this. Please feel free to comment here or to tweet me @prepper_witch! This is a response to some questions on community prepping posed on YouTube in response to my video: WROL: Lone wolf prepper? Prepper group? Is there another option? A community prepping organization can be set up as a non-profit. It does not have the authority do “take” or “order” anything. The organization has the pre-SHFT mission to educate the town (people and government) on preparedness and conduct activities to help the town to be prepared for a worst case disaster. Should a disaster happen, the organization provides preparedness resources and expertise to the town government. For example, the organization may provide trained and equipped people to the police department – The Police Chief would be in charge of these people. The organization may provide personnel and resources to start a medical facility for the town. The organization may provide food, water, expertise, equipment and plans to the town. The bottom line is that the town government is in charge (and the aim is to keep it in charge – and not the looters/criminals). The more prepared a town is, the better options they have. For a fictional example of what I’m talking about, look at William Forstchen’s “One Second After.” In that town, the government debated “taking” food from the prepared people, but decided against it. If a community is prepared, they have better options and can make better choices. If they are prepared ahead of time to assist the unprepared, there is less likelihood of something like this occurring. 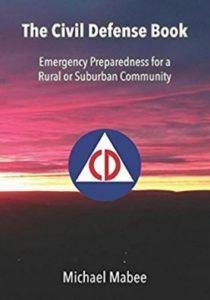 Remember too that the community prepping organization that was working with the town is likely comprised of preparedness minded people (e.g., “preppers”) and so isn’t it better to plan ahead of time to assist the people who fail or refuse to prepare? Wouldn’t it be less likely that a government will make stupid decisions if they had better options? Can anybody “make” people prepare? No. This is America. People have the right not to prepare. So after SHTF what happens to those who did not prepare? Well, if a town has thought this through ahead of time (which few if any have right now), they would plan for this. You will never have everybody in a community prepared. So perhaps the town and the community prepping organization decide that they will need to put food back for those who don’t. You mention “martial force” and I assume you are referring to martial law. Remember, martial law means the military takes over because the civilian government has become ineffective and cannot maintain order. The whole purpose of the community prepping organization is to work so this does not happen – so that the town government remains effective and a WROL does not happen. If martial law is declared nationally and some towns have effective governments and law and order, the overtasked military is not likely to bother with them and is more likely to devote their limited resources to other problem areas. They just will not have the manpower to bother with a town that has things under control. It is not possible to be prepared for every “what if.” It is certainly possible that people will do the wrong things. But, the more prepared a community is, the less likely this is to happen. I’m sure you could agree that people in a prepared community would have a better chance of avoiding WROL than people in an unprepared community. In closing, I would say that if you are worried about “the government” taking your stuff, the best defense would be not to let it get desperate enough to make stupid decisions like that. As I said, in a national catastrophe, survival will be a local issue. We would be unlikely to hear from the federal or state government for a long, long time. It is our towns we should worry about. WROL: Lone wolf prepper? Prepper group? Is there another option? In a WROL (Without Rule of Law) situation, are you better off as a lone wolf prepper, a member of a prepper group or is there another option? This is a video response to HealthyPrepper’s YouTube video: “Preppers Survivalists: Lone Wolf vs Group Survival Approach after SHTF WROL – Pro’s and Con’s.” This is a much debated topic in the prepper community and HealthyPrepper did a great job of outlining the advantages and disadvantages of each approach. But are these the only options? The answer is no. 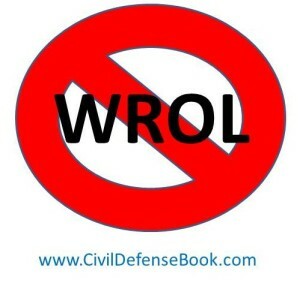 Both the lone wolf prepper and prepper group approaches are “reactive.” In other words, it is a forgone conclusion that a WROL will occur and preppers in these two categories are thinking about how they could react to the WROL. There is a third approach which is “proactive” and has none of the disadvantages of the others. In a sentence: Don’t let WROL happen to begin with. In this video response, I explain this approach. Here is HealthyPrepper‘s video in case you haven’t seen it.